Our giant swimming pool is surrounded by rich vegetation and an exotic palm tree garden, which can be seen throughout the glass wall of lobby and the dining room. In the Palm Garden, you will find a jacuzzi, children's pool, and a snack bar. 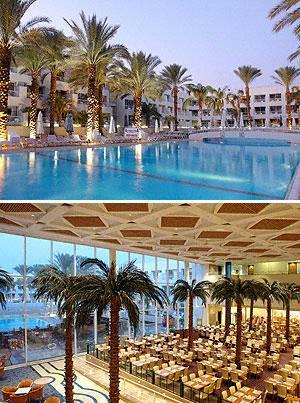 The Royal Tulip hotel is located on the northern beach of Eilat's bay. This impressively designed hotel offers you an abundance of leisure and activities, which will make your stay a pleasant one, and will transform your vacation into an unforgettable experience.